How To Tuesday - Pebbles, Inc.
Congratulations! Please email your full name and mailing information (including your phone number for shipping purposes) as well as your choice of Pebbles collection to pebblesincdt(at)gmail(dot)com and put “Spring Winner” in the subject line. Also if you haven’t seen yesterday’s post with our new mid-release collection Floral Lane you’ll want to check it out and be sure to leave a comment for your chance to win this gorgeous collection! You have until midnight tonight to enter to win! First you’ll need to gather your supplies. 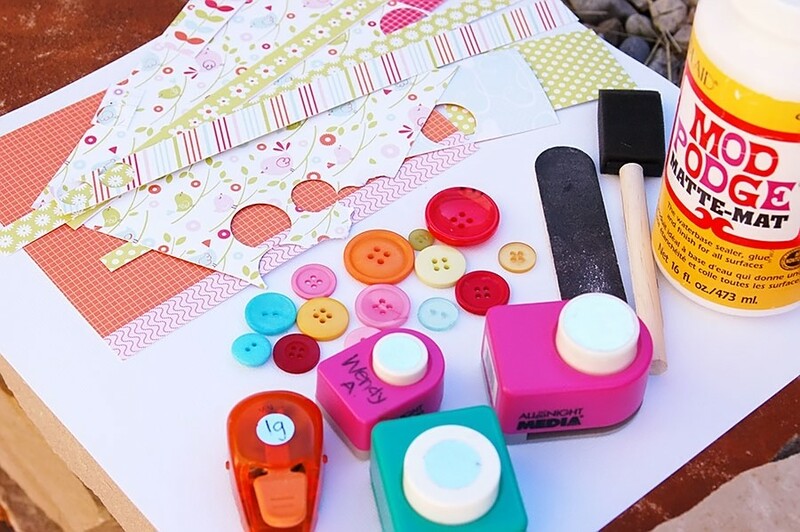 Here’s what you’ll need: paper scraps, random buttons (you can use any color, but if you have colors to coordinate with your papers, that’s even better), circle punches in various sizes, Mod Podge, sponge brush, and a small file or sandpaper. 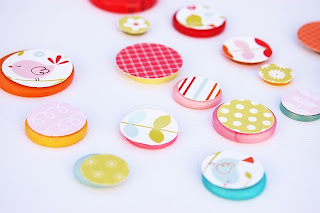 Punch several circles from patterned papers. 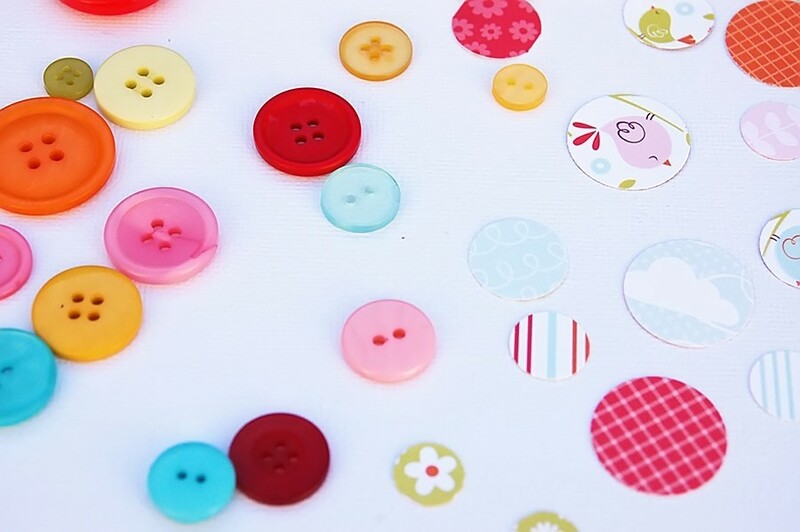 Place punched circles over buttons – it’s best if the paper circle is slightly bigger than the button, but it will still work even if it’s slightly smaller, you will just be able to see the button around the edges. Use Mod Podge to attach the paper to the button, apply another layer over the top of the paper. Allow to dry (this is the most difficult and time consuming part of the entire process!). 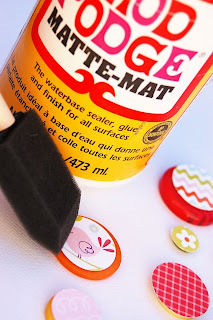 If you want to apply a second coat of Mod Podge, do so now (I usually do not use a 2nd coat – I am not patient enough). Use the file to lightly sand the edges of the paper off of the button. 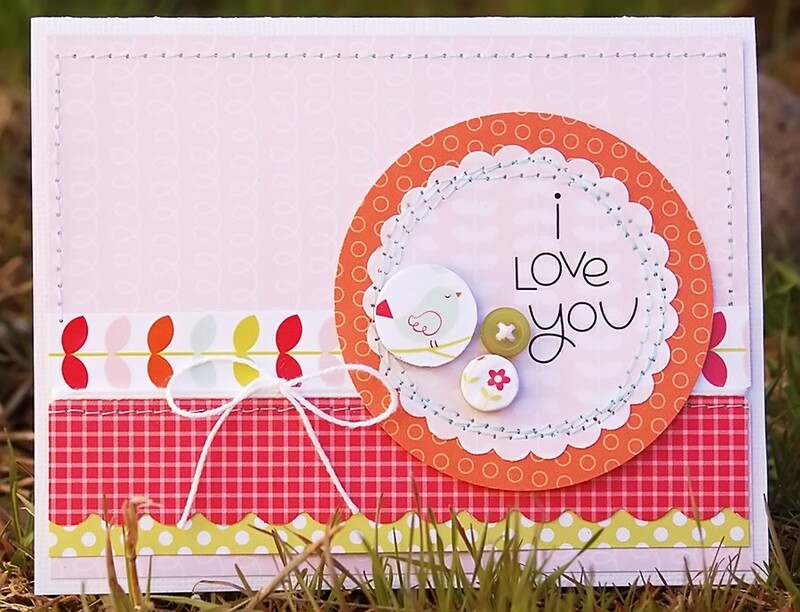 Use your fun new accents on cards, scrapbook pages, gifts, and whatever projects your heart desires! Be patient and allow Mod Podge to dry completely before sanding – otherwise you’ll rip the paper … and that’s not pretty! 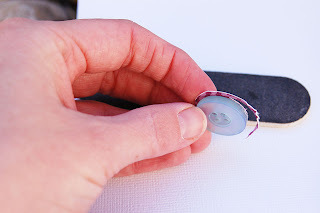 If you want the button color to show as a border around the edges, just punch the paper with a smaller punch and center the paper on the button when applying Mod Podge. 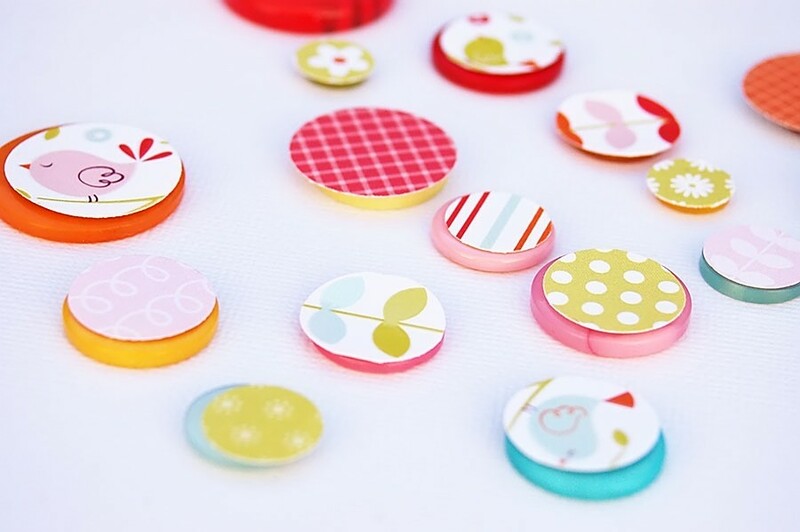 You can do a LOT of these at once … I like to do a bunch and then I just store then in my button jars with the coordinating colors. This is a wonderful way to really stretch your supplies – you can get a lot of these little accents out of scraps you might otherwise throw away! 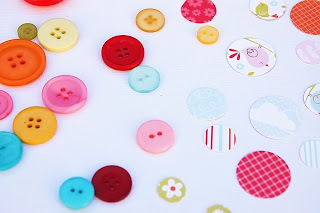 (Don’t forget to use the tear strips on your Pebbles papers – they are perfect for smaller buttons). 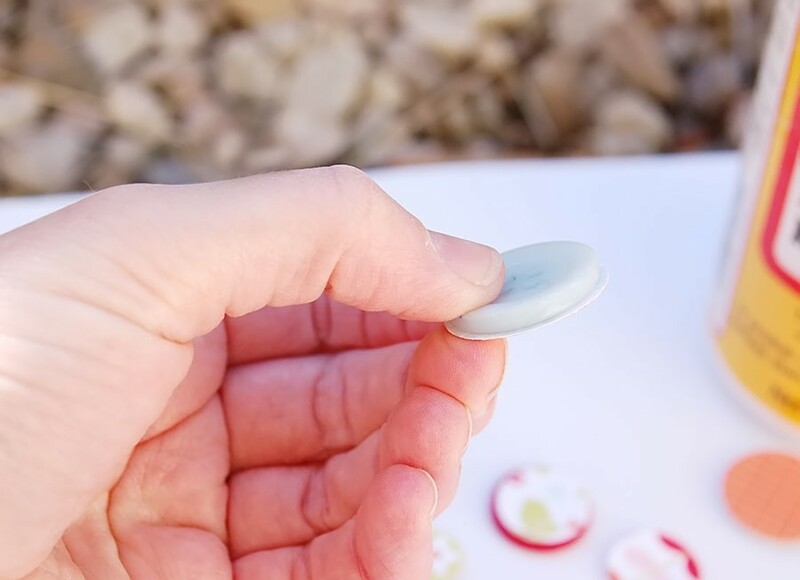 Don’t feel limited to round buttons – you can use any shape, just hand-cut or use a different shape punch – when you sand the edges, you will get rid of the excess anyway. great technique!!!! Thanks for sharing! OH THANK YOU SOOO MUCH!!! I can’t wait to try this when I get my goodies 🙂 Happy Tuesday. 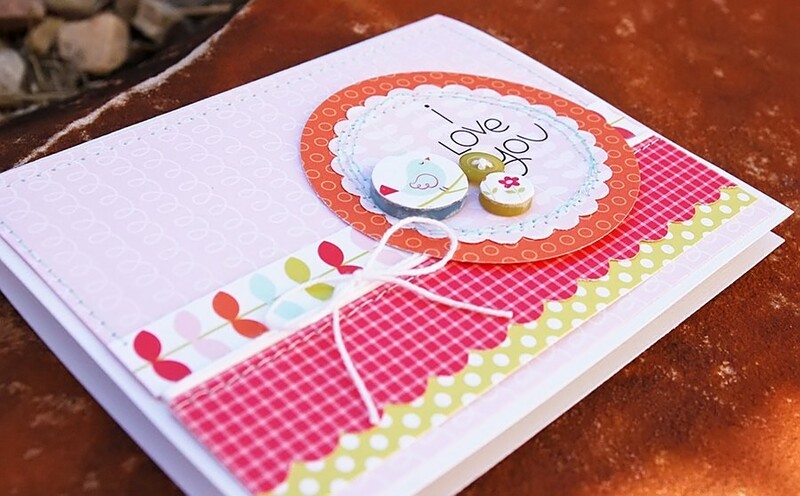 A very cute idea and a great way to use those small precious scraps of patterned paper we hate to *gasp* throw away! Very Cute! I gonna give this a try! 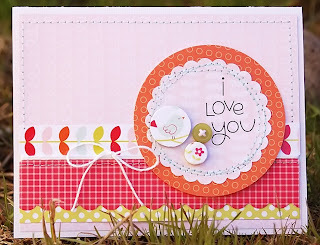 Great card samples and a great embellie tutorial, thanks!